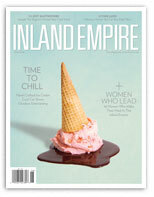 Inland Empire Magazine, like Los Angeles, Orange Coast, San Diego and Palm Springs Life, has distinguished itself as the premier publication in one of the nation’s fastest growing markets. Each month we deliver a comprehensive mix of articles, reviews and listings to keep readers up-to-date on what’s happening in our own backyard. Inland Empire Magazine. Shedding light on the issues. Recognizing the movers and shakers. Showcasing the best of our region. Put more life in your life…with your magazine. The key to building your customer base is to reach individuals with discretionary money to spend. Our strategic circulation works. Paid circulation is the key. People value and read what they pay to receive or buy on the newsstand. Our success comes in providing readers with just the right combination of entertainment and education that motivates them to subscribe, buy it on the newsstand or pick it up to read in the doctor's office. Your message gets read right along with us. We know getting people in your door is important. 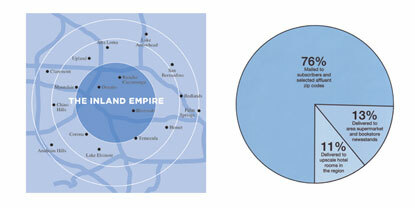 We stragically control our area of distribution to reach 255,000 readers within 27 minutes of your front door. For businesses that want to reach out-of-town guests, we have 5,000 copies in major hotel rooms in the area! Increase your exposure with opportunities for online, Facebook and more! At the end of the day we are still a community magazine and want community businesses to be able to afford to do business with us. Because we are a paid circulation magazine we have additional income sources and can keep our rates affordable. Call or contact us now to see if we reach the right audience for your business! For information on advertising: Click Here! 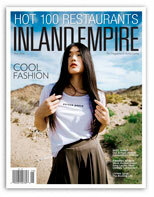 To view Inland Empire Magazine Digital Edition: Click Here!